When it comes to decorating walls, the options are varied. There are many ways for wall treatment, whether it is washable paint, wallpaper or painting. Most importantly before decorating a wall is to think very well what we want, if it matches indoor environment , and these material properties. For example, it is not adequate to put a wallpaper in the bathroom due to moisture. The easiest way in terms of wall decor is washable paint. It is easy to apply and easy to change if we want to make some changes. It can be applied uniformly, so we have a spot of color that should be taken into account in the spatial planning or in stripes or other designs using one or more shades. These areas of color are uniform, so does not feed very much in terms of interior design. They just emphasize a particular area. 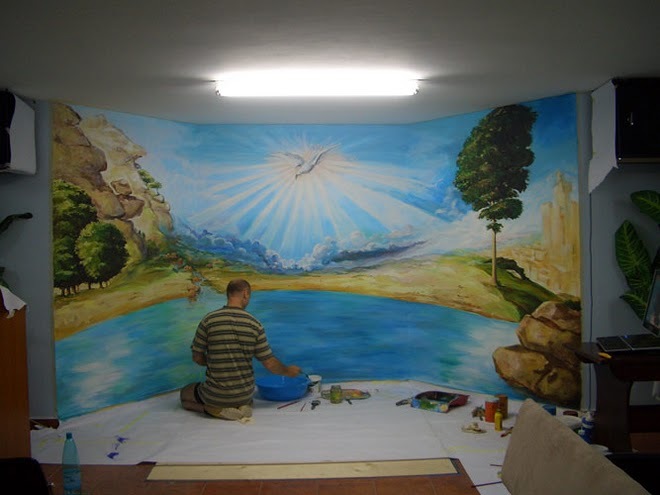 Another possibility of using paint would be wall painting. Although it is more precise and it requires a little patience and skill, has a stronger impact on the environment. In this case, the decor coordinates all development. He must be valued and support it within the other colors used. Further, we have the washable decorative paint, stucco type, which adds sophisticated style for the room. Being loaded and glossy – visually aspect -, it must be used carefully, without excesses. 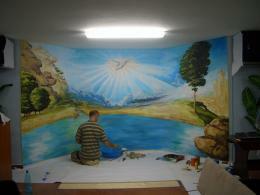 Wallpaper is often chosed as a solution to decorate the walls. It is available in a wide range of textures, suitable for any style. From the silk or velvet flowers, from the industrial to heavy traffic, the wallpaper has a strong aesthetic impact on any interior. Another way of decorating the walls, though rare in residential areas is mosaic or tiles. Contrary to the prejudices, there are certain types of mosaic that can completely change a room, bringing enhanced style. Also, new trends in design have brought indoor use of exposed concrete, metal and glass. Wall decoration possibilities are manifold. All is about what you want to get in the end and how far you have the courage to go with the materials used.